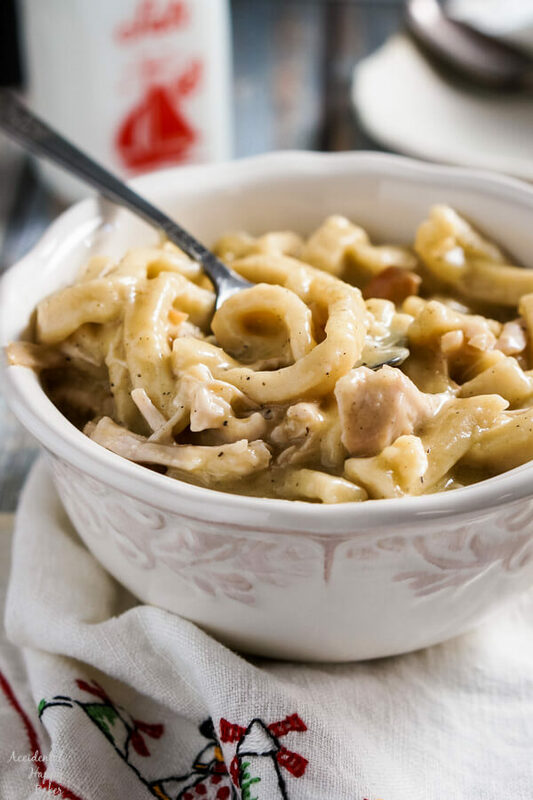 Classic creamy turkey and noodles are comfort food at it’s best, but take less than 30 minutes to cook in the instant pot. I love the look on people’s faces when they ask me about what I made for Thanksgiving. Even though I have this website and I obviously love to bake and cook, I don’t get asked to make much for this particular holiday! The grandmas rule supreme. I have 2 signature dishes that I make for Thanksgiving dinner: cranberry sauce and sweet potato souffle. That’s it. I do, however, cook turkey pretty often through the winter months, because my family requests turkey and noodles on a regular basis. 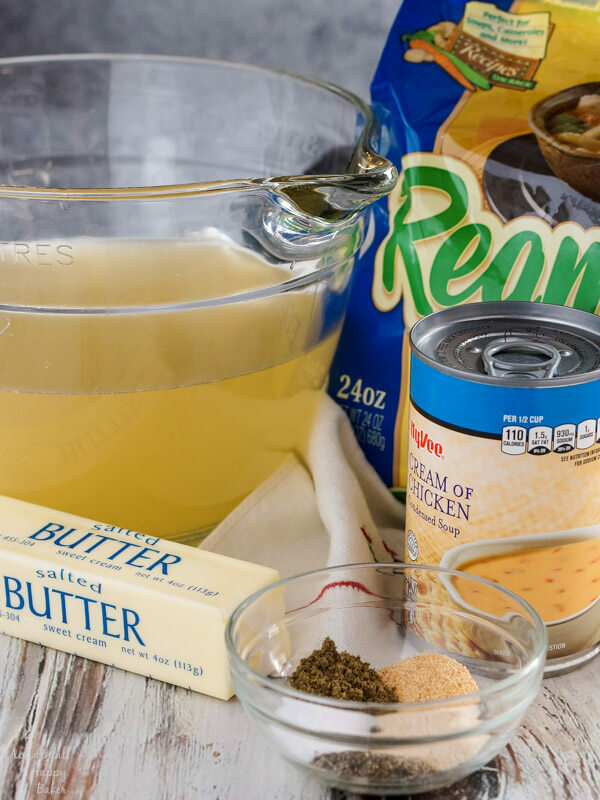 This recipe is one of my tried and true repeat favorites that I’ve converted for the Instant Pot. The kids love it because it has creamy, tender noodles and juicy bites of turkey. I love it because I can throw it together and have a dinner that tastes like it took all day to cook, but it’s done in under 30 minutes. 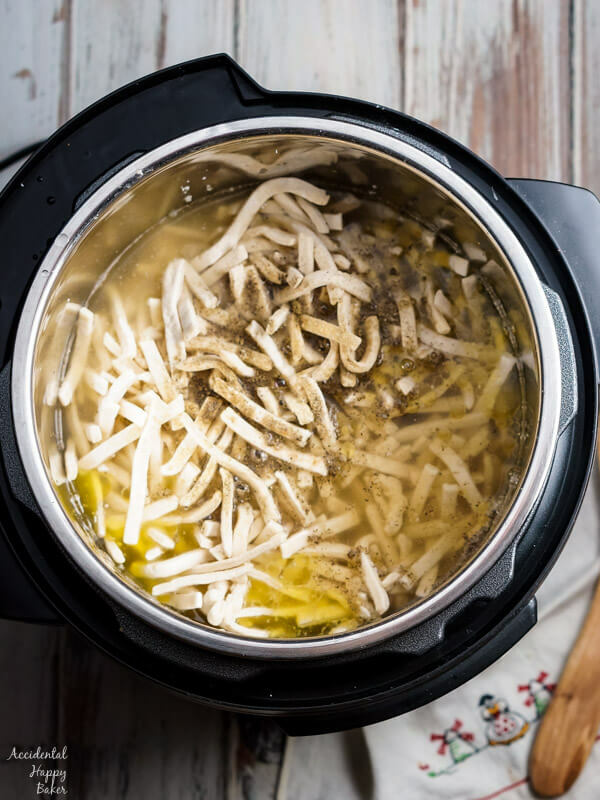 This is my favorite instant pot recipe and the first one you’ll find here on AHB. I am ashamed to admit I got my Instant Pot last year for Christmas and then I let it sit in the box for months until we got completely moved and settled into our new house. I’m not going to wax poetic for paragraphs on this thing. I’ll simply tell you the hype is real. 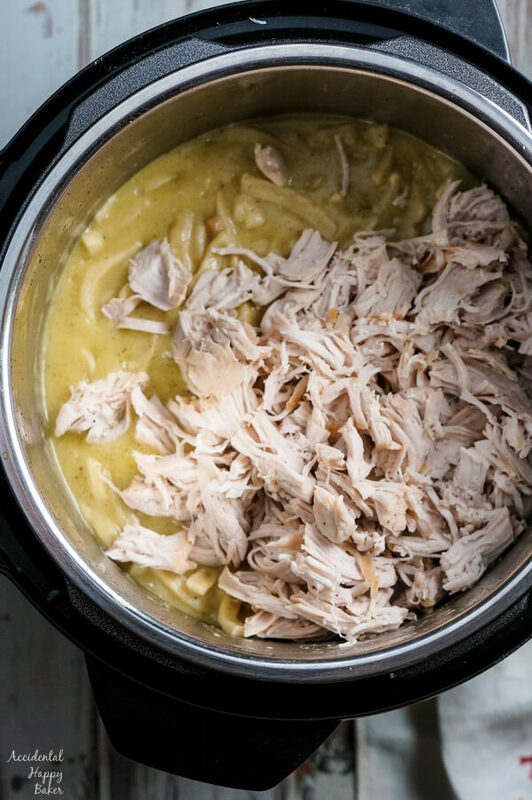 If you are a busy mom who often forgets to plan ahead for meals, an instant pot will be your new best friend. Have an instant pot, but unsure where to start? Here’s a great guide for beginners. 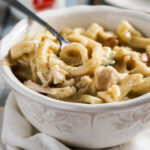 The beauty of this recipe is just how quick and easy it is to make homestyle creamy turkey and noodles. Take a package of turkey cutlets and put them in the bottom of your instant pot along with a ½ a stick of butter. Spread a can of cream of chicken soup over the top of the turkey cutlets. Dump a package of frozen noodles in. Toss in the seasonings and top it all off with a quart of chicken broth. Then the top goes on and it cooks on the manual setting for 20 minutes. Do a quick steam release. Remove the turkey cutlets to a plate and shred them. Stir the shredded turkey into your noodles and you’re good to go! I love serving up these Turkey and Noodles with some mashed potatoes or my sweet potato and sage scones on the side. 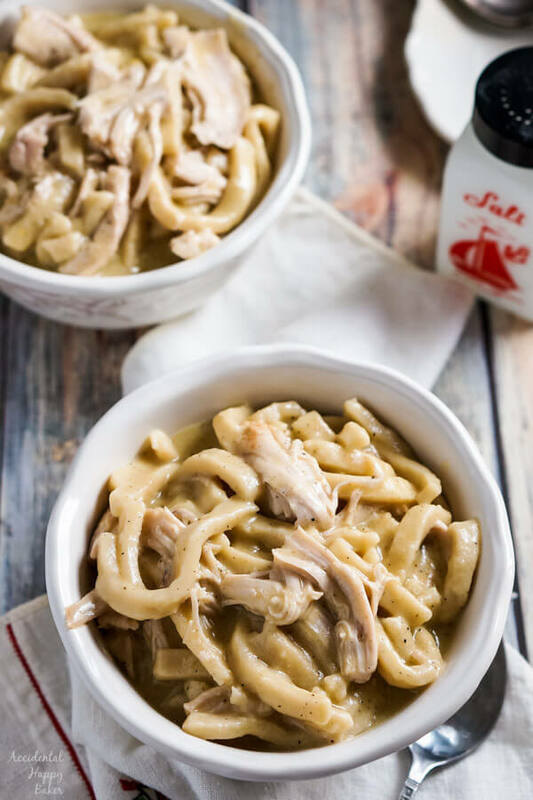 Classic creamy turkey and noodles are comfort food heaven and take less than 30 minutes to cook in the instant pot. Add the turkey cutlets to the instant pot. Spread the soup over the top of the cutlets. Add the remaining ingredients to the instant pot. Place the lid on the instant pot, making sure the valve is closed. Cook for 20 minutes on the Manual setting. Do a quick steam release. Remove the turkey cutlets and shred. Stir the shredded turkey into the noodles and serve. 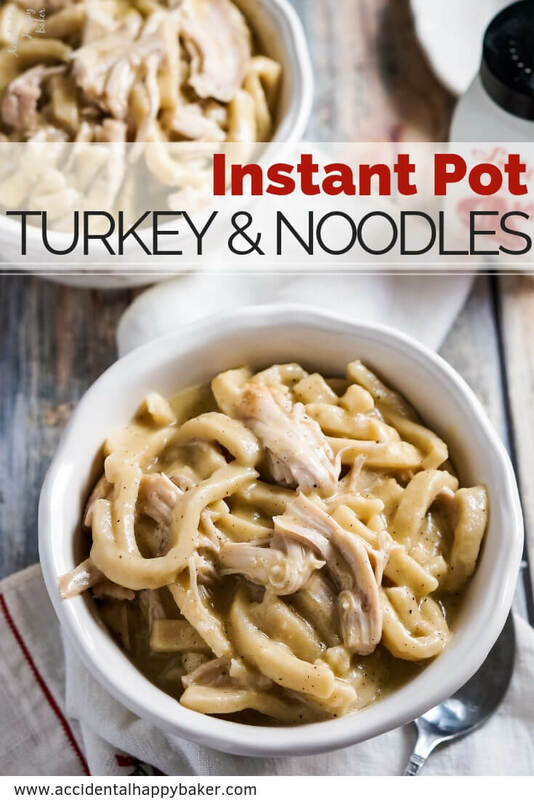 This is a great idea I have never used the Instant Pot to cook pasta I guess I need to start doing this your turkey noodles look so good and easy to prepare. So far I’ve only used my Instant Pot to cook the really chunky frozen noodles like these that usually take a while to cook. Other kinds of pasta it kind of seems redundant to use the IP because they cook so quickly anyway. This dish is definitely going to be a favorite of my family. It looks so delicious and welcoming. Yes! I’ve been meaning to try making a pasta dish in my IP, and this recipe looks so hearty and comforting!!! I can’t wait to try it! This is an absolute comfort food for cold days. Need to try it soon. It looks delicious. This looks like a total comfort food win! I can’t wait to try it! We sure think it is! Hope you’ll enjoy it, Jessica. So glad that you enjoyed it Tracye!